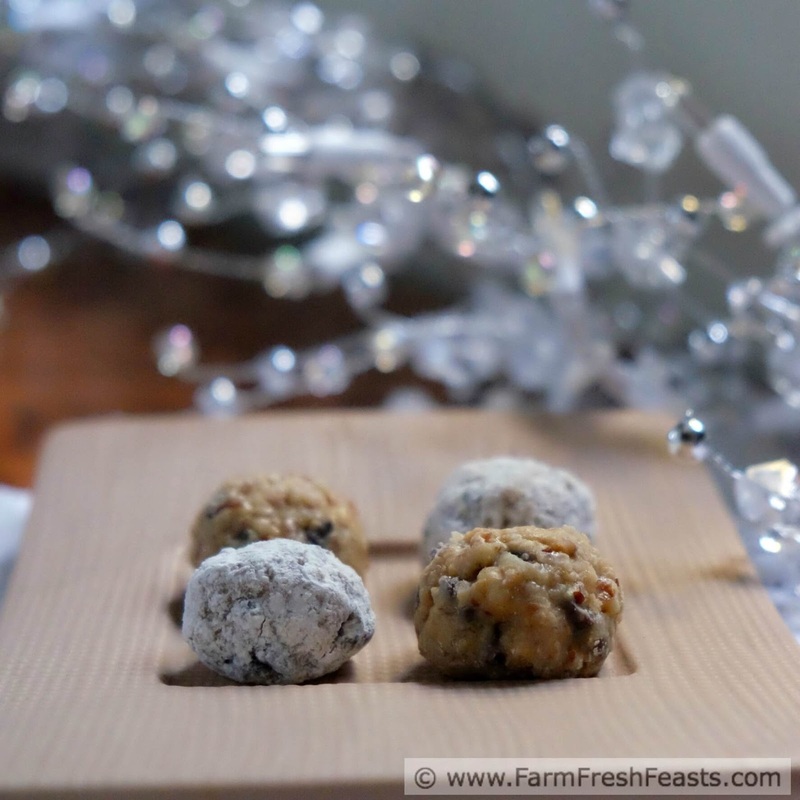 Farm Fresh Feasts: Magic Cookie Bar Truffles and Amazon Gift Card Giveaway for #ChristmasWeek! Magic Cookie Bar Truffles and Amazon Gift Card Giveaway for #ChristmasWeek! Have you tried those decadent squares of chocolate, coconut and nuts on a graham cracker base covered in sweetened condensed milk? I grew up knowing them as Hello Dolly Bars, but the Eagle Brand website calls them Magic Cookie Bars. 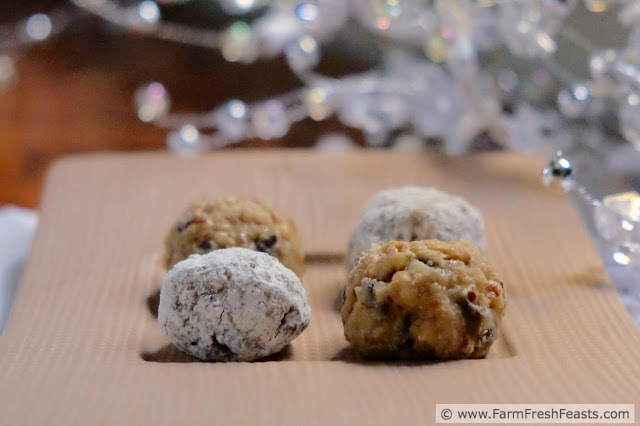 By either name they are a tooth-cracking sweet treat that snazzes up a holiday cookie tray. I didn't make those for my 5th recipe for #ChristmasWeek. You can find that one on the manufacturer's website anyway, you know? Last time we made a pan of Hello Dolly Bars, for some 'shop the pantry first'-induced dessert craving, I wondered aloud about trying a no bake truffle version. Surely, I thought, the sweetened condensed milk folks have made one. I stopped calling myself Shirley and searched several large recipe sites and chocolate cook books using various combinations of names and never found the Magic Cookie Bar turned Truffle. I think I may know the reason. This batter looks like suet. It really does resemble the blocks I stick in the bird feeder all winter to attract carnivorous birds who theoretically will stick around come summer and eat the bugs off the vegetable plants in my garden. Hey! A bonus gardening tip with your Christmas treat! At this point it's about 50-50 who is getting more bird suet--our dogs Robert Barker and Vincent or the birds. If I wanted to snooker my kids I would tell them I am making my own bird seed cakes. Since I make dog food this would not be too much of a stretch. But I am a nice mom, despite banning screen time during many of their waking hours, so I told them up front what's in these treats. Like I do with My Family's Favorite CSA Veggie-packed Spaghetti Sauce. Nope, no eggplant in these balls. Shown with Cranberry Chai Tea Cookies. After you roll the truffles in a coating of powdered sugar and graham cracker crumbs these little morsels look like a tasty treat for humans and I'm glad to bring them to the #ChristmasWeek cookie tray. They fit nicely in mini muffin-sized paper liners and nestle well in a repurposed cookie tin, and if you're taking a couple dozen to the Airmen's Cookie Drive consider transporting them in a washed egg carton. I looked a recipe for Cranberry Walnut Truffles and morphed it into the recipe below. 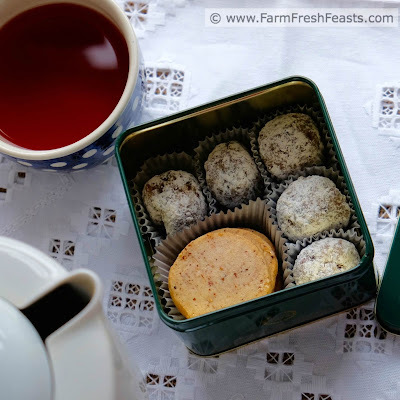 The batter for these truffles can hang out in a container in the fridge for several days, just mix up the powdered sugar and graham crumb mixture right before you're ready to roll. Or leave them naked--your choice. In a large bowl, stir together first 4 ingredients (graham cracker crumbs through coconut). In a small bowl (I used a 4 cup glass measuring cup that I'd melted the butter in) stir together the melted butter, vanilla, and sweetened condensed milk. Pour the liquid mixture over the dry mixture and stir well. Yes, it looks like bird suet. Transfer the mixture to the fridge to chill overnight or at least an hour. This can keep in the fridge for several days. To assemble the truffles: in a small bowl, stir the powdered sugar and graham cracker crumbs. Scoop up about 2 teaspoons of batter, roll into a ball, and roll in the powdered sugar mixture. These can hang out at room temperature for a few hours but should be chilled if it's going to be longer than that. Welcome (back) to #ChristmasWeek! Kim, of Cravings of a Lunatic and Kiss My Smoke, has assembled a hardy bunch of bloggers to share holiday treats all week long. We even chipped in for an Amazon Gift Card Giveaway--one $500 Amazon Gift Card, one $250 Amazon Gift Card, and one $50 Amazon Gift Card. You make me want to share a dessert recipe on the blog. Salivating. I bet you rock desserts as much as you rock granola. And pizza. And soup. And sandwiches. And smoothies. . . . I love your plan Kirsten! Snooker the kids! Sadly, I realized that this recipe is the perfect one to have the kids assemble. They made up a tray for their cousins, made up a tray for friends. No more snookering. Ah well, something to look forward to! You crack me up! The middle stage really does look pretty bad but the end result more than makes up for this. Now, I just have to figure out if I want to share them with my kids! I'm glad to make you laugh . . . I'll be here all #ChristmasWeek! I figure, the more I share the less I eat, the less I have to work off! I don't know why but I howled with laughter at the part where you put "(back)" to the welcome. Seriously, just sitting here giggling like an idiot. I adore truffles and could eat my weight in these bad boys. Which is saying something. Ha! If you're giggling at my babbling, I think you're a little bit punchy after working such long hours! 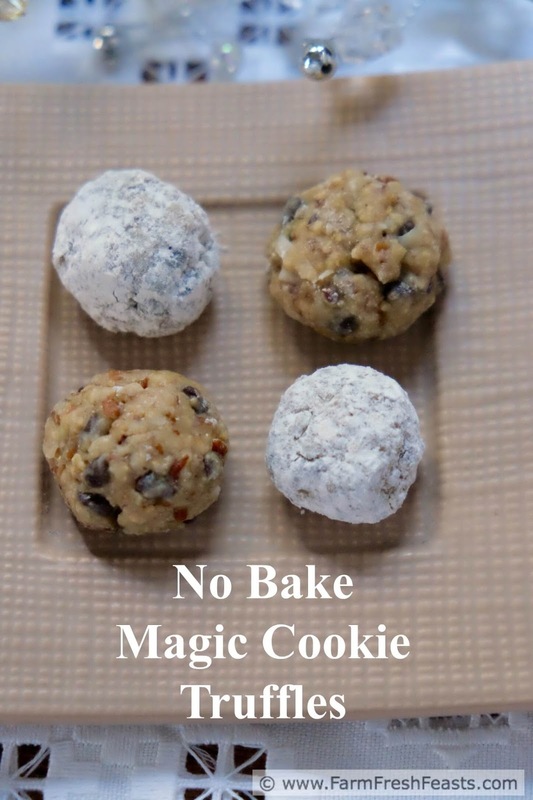 As the craziness of the holidays gets into high gear, I'm going for the no-bake recipes. And this one is right up my alley. Of course, I won't tell my guests that they began as suet-resembling "batter." Happy holidays! Who knows, some of your guests may get a kick out of it? 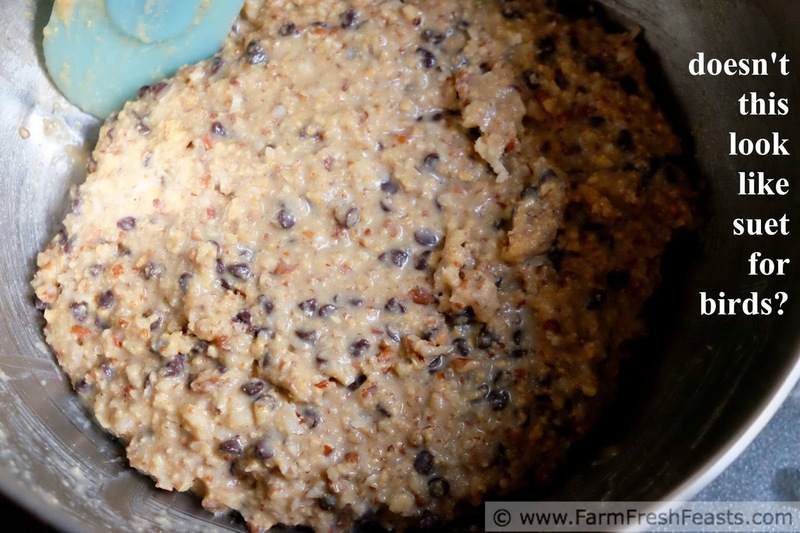 Or not, actually, now that I'm remembering what the 'glue' that holds all the seed together in real suet is. Or at least what we used when I was a kid. Thanks, and happy holidays to you!